The youth ministry at RLBC is centered around fellowship and discipleship. We believe that the faith of Christian young people thrives best in fellowship with others. As young people spend time together sharing their faith, they build each other up, encouraging and inspiring one another to be more like Christ. This is done through regular events such as mid week youth groups, youth services and Sunday morning groups, as well as one off events such as a youth weekend away, parties and movie nights. We break the youth ministry down into two age groups. Covies is our group for young people age 11-14 (School years 7-9). It meets on Sunday mornings during the 11am service. We spend this time on Sunday reading books of the bible and discover how they are relevant to us today. When we do ask such questions we find the Bible is alive with characters that face many of the same issues we face today. 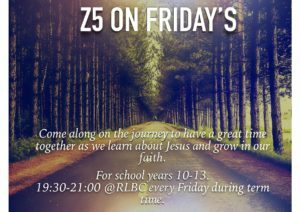 Zone 5 is our group for young people age 14-18 (School years 10-13). This group currently stays in the service the first 3 Sundays of the month and has its own group on the 4th Sunday. In this group we want to develop the leadership potential of the young people and so they are encouraged to use their gifts serving on a Sunday morning in different ways, such as operating the audio visual systems, helping in the children’s groups, assisting with stewarding and playing in the band. We hold regular youth services in conjunction with Elmfield Church on a Sunday evening. These include a talk from the Bible, songs, drama and prayer. These services are predominantly run by the young people themselves! All ages are welcome at these services and so we would encourage families to come together. Please see the church calendar for upcoming youth service dates. We run Midweek Covies for those aged 11 to 14 which meets twice a month on a Thursday evening from 7.30-9.00pm. Check the Church Calendar for dates. We also run a weekly Bible study group for Zone 5. At this group, we enjoy hanging out together and discovering more about Jesus. This takes place every Friday during term time from 7:30-9:30PM. We also seek to plan various social events for both groups as well as visits to Christian youth events. Dates are included on the Church Calendar. In addition, we encourage our young people to be involved in the life of the church in various ways, including helping with community outreach events and Holiday Bible Club. Please email us for further details about our youth ministry.